Add a unique look to your '16-Current Mazda MX-5 Miata! These awesome body side graphics are designed to fit perfectly on your MX-5 Miata's lower front fender and door panels. Starting solid at the front, the graphics gradually fade to the rear with a unique dot matrix pattern as shown. Available in four (4) colors (Black shown). 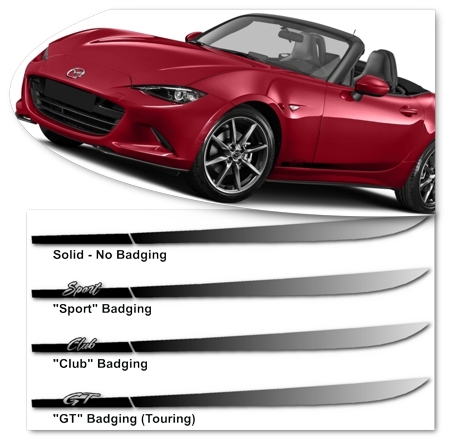 Graphic is designed to be placed along the bottom edge of the MX-5 Miata’s door as shown in product image. Dryfitting graphic prior to application is suggested to become familiar with proper fitment.